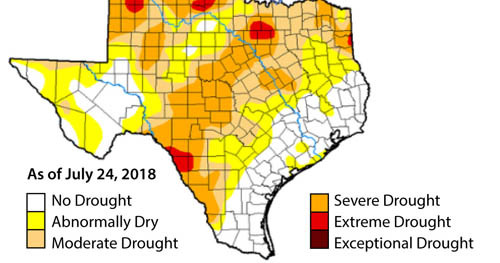 Years of rainfall missing the watershed above Choke Canyon Reservoir and dry weather this year in South Texas have triggered Stage 1 of the region’s mandatory water conservation Drought Contingency Plan. That means that residential lawn watering is restricted to once per week. Extreme drought conditions are now indicated for San Patricio, Aransas and Refugio Counties. 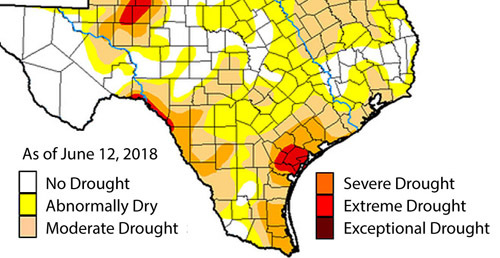 Moderate to severe drought conditions cover the rest of the Coastal Bend region which is served by the regional surface water supply system managed by the City of Corpus Christi. Water levels at Lake Texana, which supplies about half of the water provided to customers by the San Patricio Municipal Water District, have also been dropping since the fall of 2017. In mid-June the combined capacity at Lake Corpus Christi and Choke Canyon Reservoir fell below 40%. That automatically moved the region into the first level rules of the Drought Contingency Plan. The plan was revised earlier this year to better reflect expanded water supply available to Coastal Bend customers including additional water from the Colorado River via Phase 2 of the Mary Rhodes Pipeline. The result was that conservation triggers were lowered and the number of “stages” was reduced. The drought management restrictions adopted by the City of Corpus Christi apply to all customers of the regional system including those provided water through the Water District. The Water District and local cities providing water to residents are required by contract to adopt a Drought Contingency Plan that is at least as restrictive as the plan adopted by the City. The Stage 1 goal is to reduce regional water consumption by 10%. Water use restrictions under Stage 1 limit any hose-end sprinkler or irrigation system lawn watering to once per week. Corpus Christi is initially allowing residents to choose which day they water lawns but the adopted plan provides for assigning residents designated watering days based on house numbers. It also requires customers to discontinue other non-essential uses. Sprinkler irrigation is always prohibited from 10 a.m. to 6 p.m. Hand watering is allowed on any day but the hose must have an automatic shut off nozzle. Coastal Bend residents, businesses and industrial customers are being encouraged to focus on water conservation measures in all their activities. Stage 1 restrictions remain in place until combined Choke Canyon Reservoir/Lake Corpus Christi (CCR/LCC) levels return to at least 50% of capacity. Stage 2 of the Drought Contingency Plan would be triggered at CCR/LCC capacity levels of less than 30%. In Stage 2 drought conditions, lawn watering is limited to once every other week on designated days. Stage 3 is triggered at 20% of capacity and is considered a critical condition. You can download the entire 2018 Corpus Christi Drought Contingency Plan [HERE].